Electric skateboards are becoming the preferred choice of commuting in large cities. Due to pollution and congestion, people are slowly taking to the streets with their skateboards. For them, the brand new Koowheel D3M Longboard is a great option. This electric skateboard has been constructed to deliver seamless performance while travelling in busy streets, or even while commuting to work on a daily basis. In addition to such diversity, this new electric longboard comes with unique brushless dual motors that add a kick to your commute. Its build design is flawless, and its extra sturdy wheels keep the board still and low on rough terrain. It is a perfect example of a longboard that is versatile in its design and a beast in its performance. Is Koowheel D3M Longboard Safe? Is Koolwheel D3M Longboard Worth the Cost? The deck of Koolwheel D3M Longboard has been designed in an ergonomic style which makes it quite flexible during bents and turns. Its comparatively larger deck size poses no issues whatsoever on the flexibility and the durability of this board. In addition to that, the ground clearance for this electric skateboard is 85 mm or 3.35 inches. This makes the skateboard extremely versatile as it is suitable for all types of roads – be it smooth or rough. The deck is made of 7 composite layered Canadian maple woods, along with an optional glass fiber structure. The purpose of this elastic structure is to ensure that the battery pack and other accessories are safely tucked underneath the skateboard. The deck itself is pretty stable, along with sound and vibration absorbing qualities. Koowheel D3M Longboard delivers an excellent performance when it comes to non-professional skateboards. Its dual brushless DC hub motor system delivers a power of 700 watts to its wheels, making a top speed of 28 MPH. This is pretty impressive, especially when you consider its excellent quality battery. The battery underneath this longboard is a 5500 mAh UL227 Lithium ion unit that is capable of huge load and effectively good range. Thus, this electric skateboard can boast of a max range of 22 miles. You can even use its fast charging feature to charge the skateboard to full in just 45 minutes. The all-in-one hub motor system ensures a smooth ride over rough surfaces. It is also protected against water and dust, with IPX4 certification of water and dust resistance. Its PU 85A orange wheels are exchangeable in nature. In addition to that, these wheels are not too hard, thus preventing easy wear-off or sudden toppling. Its battery pack is completely removable in nature, so you can easily lift up the board while troubleshooting. Its remote acts quite fast and its controls are very responsive in nature. In addition to that, the controls are effortless and the skateboard functions very well with its digital remote. This longboard can sustain a max weight load of 285 lbs. so it is meant for adults. Upon exceeding that limit, the functionality of the skateboard is not at all affected, but its top speed and range is lowered. Koowheel already has both UL272 and ASTM certificates on this particular product so it has been explicitly tested for safety standards. Koowheel D3M Longboard costs $599 in their official website. In this price point, there is hardly a better option than this particular model. It offers a perfect balance of range and speed that is imperative for a daily commute schedule. It is in no way one of those electric skateboards geared towards teenagers or kids for recreation purposes. 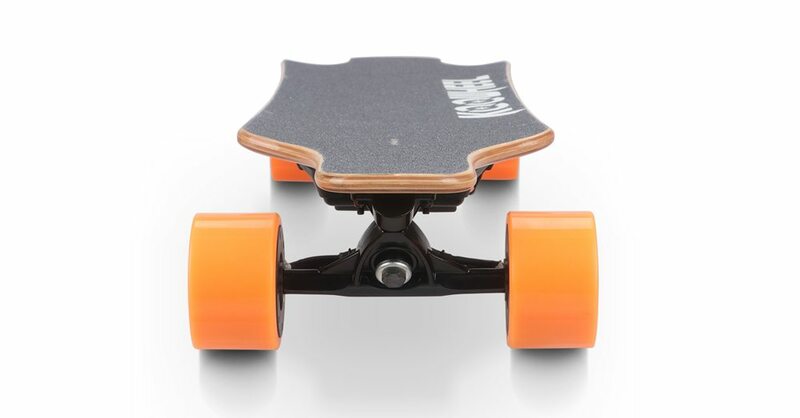 Koowheel has made their intentions clear regarding this model – they have made this long board for adults who are up for a ride on their electric skateboards. It recharges relatively fast as compared to other boards in the market, and offers a viable alternative to public or private transportation.